Category Archives: Wild Waves Brewing Co.
3 - Indifferent (buy if no other choice), American Wild Ale, Beer Reviews, South Korea, Wild Waves Brewing Co.
Brewery: Wild Waves Brewing Co. Brewer Description: (from menu at Wild Waves Brewing Co. bar) Dry hopped sour with Amarillo. 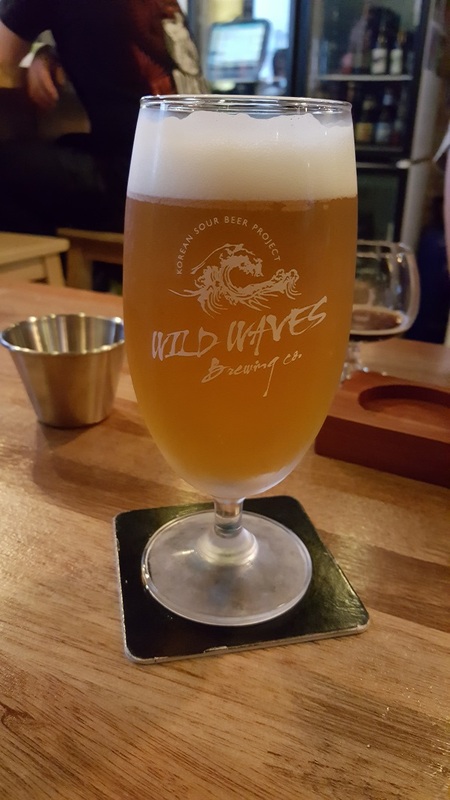 Intro: On tap at Wild Waves Brewing Co. (Busan, South Korea) into a tall tulip glass. Appearance: It arrived a clear-ish dark gold colour with a two finger white head that dissipated quickly but left nice lacing. Aroma: Light subtle aromas of tart sour green apple and banana. Taste: Sour green apple, apricot, lemon and a light funk. Overall: Crisp and easy to drink. A nice South Korean sour beer.